This heavy duty 10' x 12' all-purpose tarp with UV resistant silver exterior is designed to cover and protect what's underneath from rain, snow and sun. 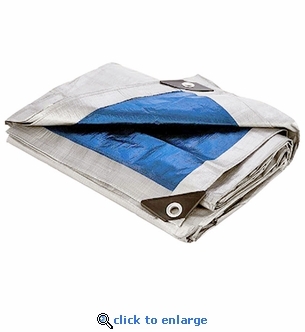 This all-purpose tarp is perfect for covering equipment, hauling cover, camping shelter or ground cover, and emergency uses. Hemmed Size 9' 4" x 11' 6"